The owners of Spirit Garden Too, Tattoos and Body Piercing on Division St. in downtown Northfield closed their shop last night. They’re not reopening in another Northfield location but possibly Owatonna and LaCrosse. They said their lease isn’t up until the end of the summer but they have an agreement with the building owner to depart now. There’s a new tennant evidently signed up who plans to open a waffles restaurant in the space, as speculated here earlier. Rumor has it that it’s a professor at Carleton. Anyone know who? 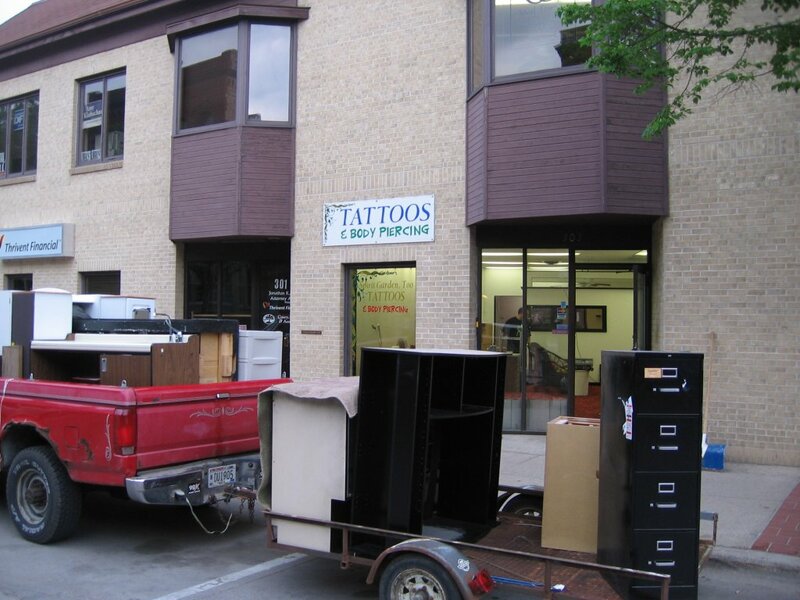 I do not know the owners of Spirit Garden Too, Tattoos and Body Piercing, but I think your posting of “packed up and left town last night” is rather harsh. Something like “removed thier shingle, and closed thier doors” may have been a better word choice. This business was downtown for a while, and am not aware of any issues. Others may not have liked that “type” of business in that space, but they seemed to conduct themselves well there. You make it sound or imply that they “snuck out under the cover of darkenss” or that “there was some other issue and the left suddenly” and I don’t think that is fair and balanced reporting, especially of a site that has folks that run it that are very “PRO-DOWNTOWN”. This business was more than likely made an offer to get out of thier lease early, as the new tennat wanted the space, and probably wanted to be open by the time the students returned in the fall. Being in early in the summer would allow for the necessary renovations and work needed to open the restaurant. Obviously, you spoke with them, or you would not have had the information in the second paragraph. I just think your reporting could have been done better. My apologies if I am taking your words “too literally” but many folks have a bad habit of not reading the complete story. I was just hoping for fair and balanced reporting. You are usually really good about this, so maybe its just the early hour. Good luck to the owners of Spirit Garden Too, Tattoos and Body Piercing in whatever they choose to do, and I personally think a waffle restaurant will be a welcome addition to downtown. Hopefully they will have outside seating along the sidewalk! 😎 No worries Griff. Keep up the good work. The proprietor of the new waffle shop is Louis Newman, Religion Department Chair at Carleton.